The opening credits are about average length. Download time is quick. After the initial setup the first time the game is played, thye menu structure is easy to navigate. "DS Download Play" is right on the main menu. The menu system, however, is extremely primitive. There is no touch screen input at all. There are even places where options are hidden and not clearly labeled. Specifically, when playing VS Battle mode, the ability to move to the next screen of options is hidden within the Item settings line. The gameplay is simple and direct. Most of the controls are based on pushing up, down, left, or right on the Direction pad. The "A" and "B" buttons rotate the tetrominos and the "L" and "R" buttons manage the ability to hold. Everything works exactly as expected, and promptly. Graphics on a Tetris game have never been a major concern. There's nothing wrong with the graphics in Tetris Party Deluxe, but nothing spectacular either. Audibly, the game has a good soundtrack. There is some familiar music in the game, as well as some newer tunes. Tetris Party Deluxe, however, is greatly lacking is features. Compared to its predecessor, Tetris DS, Tetris Party Deluxe has only two multiplayer modes via Single-Card Download play (one if you're not playing with exactly two players) instead of three. The new game also supports fewer players: eight instead of the previous ten. Finally, as this Tetris wasn't designed specifically for Nintendo to publist, all Nintendo references are gone. No graphics, music, or references to Mario, Donkey Kong, or the rest. It's not often that a game's "sequel" or "follow-up" has a different publisher. Sure, sometimes a publisher will buy out another, but that aside, Tetris is unusual circumstance. In this particular case, the change of publishers contributed to a significant change of game. When Nintendo published the last Tetris title (Tetris DS), the game's different modes were each themed to a Nintendo franchise - Mario, Donkey Kong, The Legend of Zelda, etc. Tetris DS also had three different Single-Card Download modes, while Tetris Party Deluxe has two, or one if you have just two players. Tetris Party Deluxe is a competent gqame of multiplayer Tetris. It works well, there're no glitches, and just like any other game of Tetris, it's endless. Unfortunately, it's also bland. The charm is gone, most of the modes are gone, and the game (in terms of multiplayer) is as basic as basic can be. If you're looking for a solid game of Tetris to play, Tetris Party Deluxe will work out fine. If you're looking for more variety and selection, track down a copy of Tetris DS instead. Allow the game's menu system to be navigated using the touch screen. 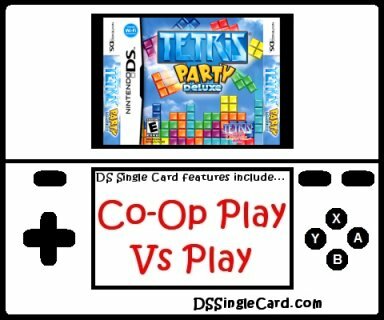 Offer a version of Co-op Tetris for more than two players. Make a downloadable Demo available. Click here to return to the DSSingleCard.com Tetris Party Deluxe profile.